Hey, so it's now autumn! Except some days, I don't believe it, especially yesterday, when it was still fairly hot out. Is this Indian summer? Whatever it is, it hasn't stopped me from making dinner soups like they're going out of season, or sipping on hot tea after dinner. 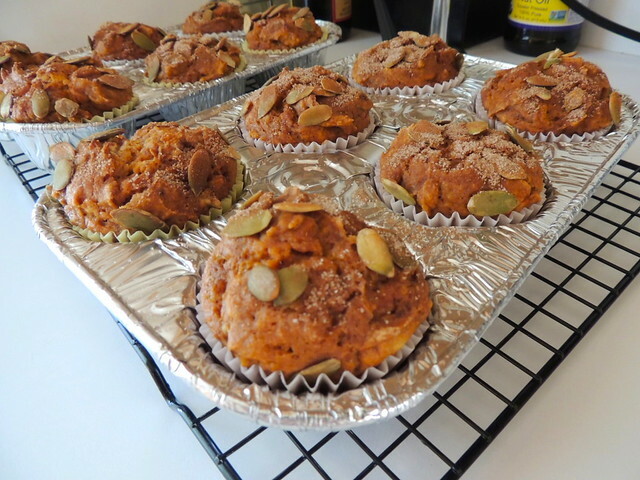 I've also busted out the pumpkin puree so that I can share with you my favorite pumpkin muffin recipe. I found this particular recipe from Muffin Top, who got it from Gourmet magazine. Do you remember that magazine? It was great and I'm still sad it's gone. 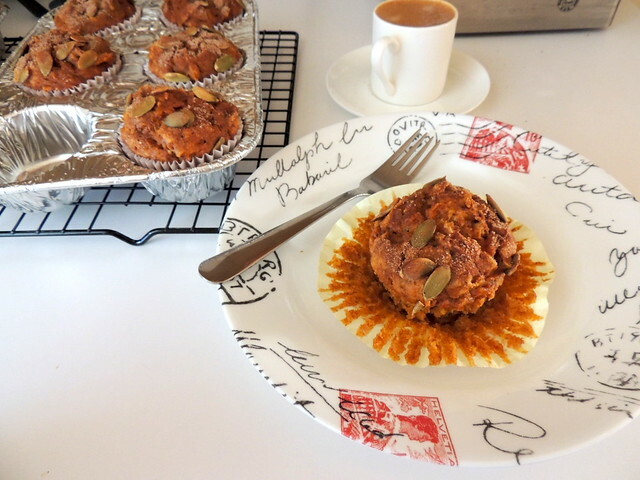 The bright orange color of the muffins lured me in and I wasn't disappointed. This recipe is super simple and makes tall, moist muffins, not those squatty little pucks that drive me crazy. Best of all, you use the entire can of pumpkin puree so you don't have to store 1/4 cup of puree, only to have it rot in the depths of the fridge before you remember that it's there. 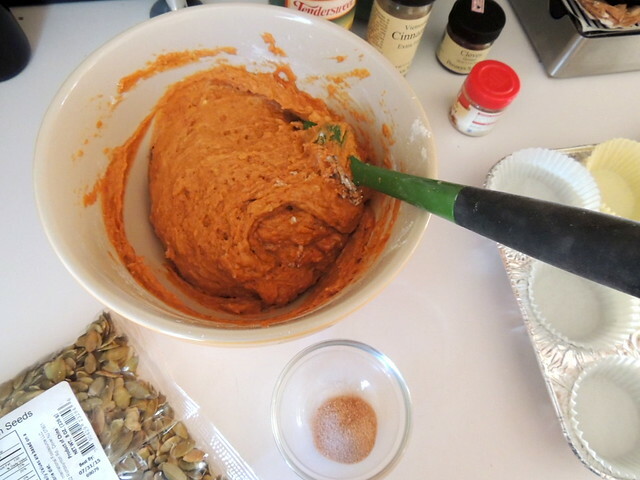 The recipe's direction for mixing the batter is a bit weird, so I simplified it by mixing the dry (flour, spices, leavening, salt) and wet (pumpkin, eggs, oil, sugar, vanilla extract) ingredients separately. 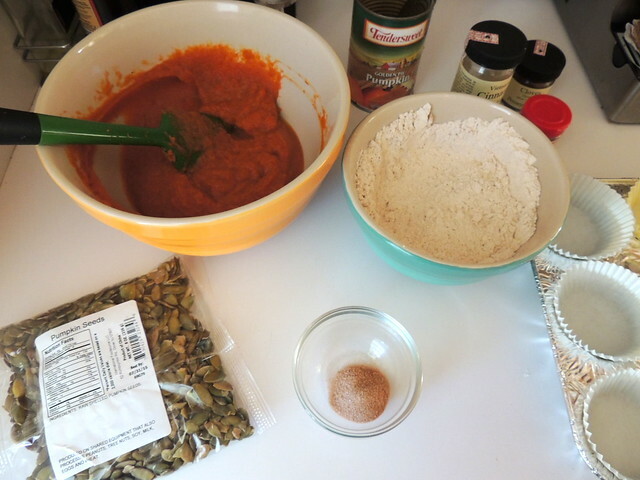 I also use my own combination of spices instead of a generic pumpkin pie blend. I like that I can decide to use more cinnamon one day, then turn around and make the next batch more gingery. In total, I use two-three teaspoons, not just one. One teaspoon isn't enough. And with a teaspoon of vanilla extract for added depth. You can leave the sugar as is, or you can decrease to 3/4 cup like I did this last batch. The recipe is included in this post to make the modifications clearer. 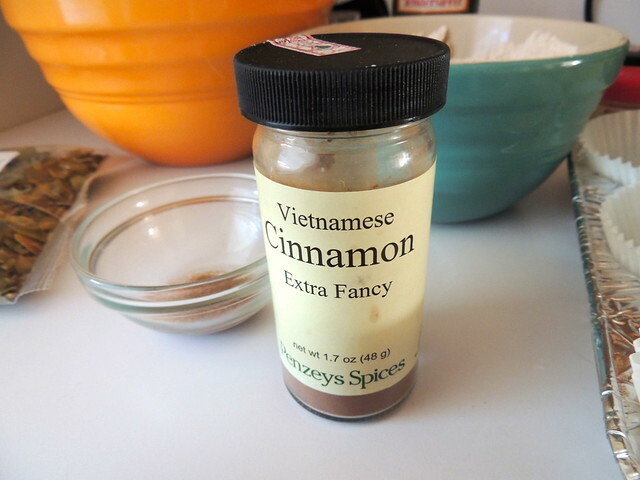 Dear readers, I can't go another post without addressing this Extra Fancy (ooh la la) Vietnamese cinnamon from Penzey's spices. I was first introduced to it by a friend, Bob, who sent me a Penzey's spice gift box. This cinnamon is very spicy and strong; Penzey's recommends reducing the cinnamon in a recipe by a third if using this kind. I like to think that it justifies the price that way, though if you love cinnamon, go all out! Next, fold the dry ingredients into the wet, then divide evenly into twelve muffin cups. Exactly twelve muffin cups. You can fill the cups up just about all the way without causing a disaster, I promise. 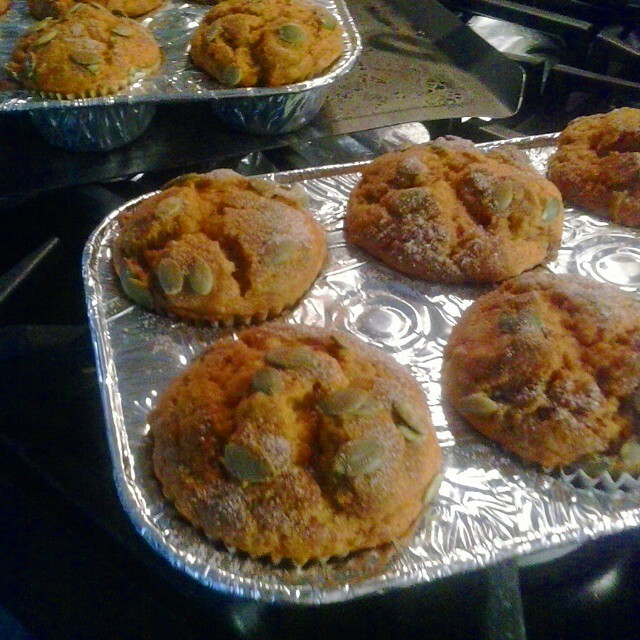 Sprinkle the tops with cinnamon sugar (and add pumpkin seeds, if you wish), then bake. Now, I have a secret to share with you. These pictures, while mostly accurate, are a lie -- I forgot to add the oil. Although I noticed that there wasn't quite as much batter as there normally is, I didn't realize my mistake until after I had stuck the trays into the oven (I blame Gilmore Girls). I expected a disaster, and wasn't disappointed. While still edible, this batch just isn't as soft and tender as it normally is. The tops are more craggy than usual and the crumb suffers. I would absolutely not recommend skipping the oil. Please. Here is what the muffins should actually look like if made properly. I promise, I know what I'm doing, most of the time. Despite the error, the flavor was still there. Not bad for a mostly fat-free baked good! (I can't believe I said that.) I hope you enjoy these as much as I have! Put oven rack in middle position and preheat oven toe 350°. Put paper or foil liners into 12 muffin cups. Whisk together flour, baking powder, baking soda, salt, and 2-3 teaspoons spices in a small bowl. Stir together cinnamon and 1 tablespoon sugar in a tiny bowl and set aside. Whisk together pumpkin, oil, eggs, vanilla extract, and 3/4 - 1 1/4 cups sugar in a large bowl until smooth, then whisk in flour mixture until just combined. 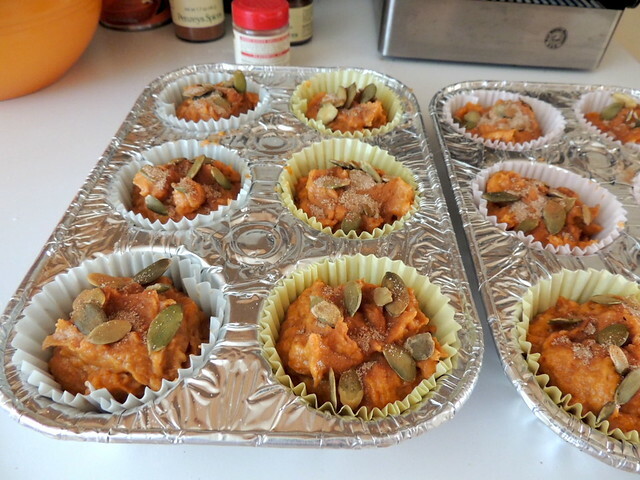 Divide batter among muffin cups, then sprinkle tops with cinnamon-sugar mixture (if using pumpkin seeds, top with seeds first before sprinkling tops with cinnamon-sugar). Bake until puffed and golden brown and a wooden pick or skewer inserted into center of a muffin comes out clean, 25 to 30 minutes.